The next generation of computers may make use of the "spin" of electrons instead of their charge. 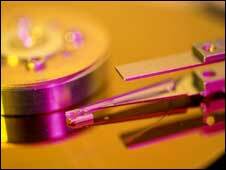 Spintronics relies on manipulating these spins to make them capable of carrying data. The technique has been shown in a number of materials at low temperatures before. But researchers writing in Nature have made use of these "spin-polarised" electrons in silicon at room temperature for the first time. The result could lead to computers that require far less power than conventional ones. The fact that the effect has been demonstrated in silicon - the material that already underpins the computer industry - means that devices exploiting it could be made on a commercial scale more easily. The problem with silicon is that, as the individual features on silicon chips get smaller and smaller, they require more and more power to move the charged electrons around to represent 0s and 1s of binary code. That rise in power also means that future chips will run into problems with heating. Spintronics has long been touted as a future potential mechanism for computing, but so far advances have come slowly. The idea rests on manipulating the "spins" of electrons, which can be either "up" or "down", a choice between two states that is analogous to the on/off or zero/one of conventional, digital electronics. This "spin" isn't really a direction the electrons are spinning in, but rather a convenient way to express one of the two "quantum mechanical" states an electron might be found in. 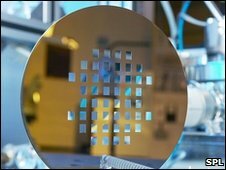 A number of laboratory demonstrations has shown that it is possible to create bunches of electrons with their spins aligned and to detect those spins in a range of materials, most importantly silicon. However, they have all been at extremely low temperatures. Now, researchers at the University of Twente in the Netherlands have demonstrated the manipulation and detection of these spin-polarised electrons in silicon at a temperature some 150C warmer than the previous record. "We've shown for the first time that this can be done at room temperature, which is obviously something you would need if you wanted to really commercialise this technology," said Ron Jansen, who led the research. The trick, Dr Jansen said, was careful design of the interface where the electrons enter the silicon - the materials must be pure and of a precisely determined thickness in order to preserve the delicate spin polarisation. "Let's say it's the first real step towards a real working technology," Dr Jansen told BBC News. "The next one is actually to build real electronic circuits and show that they are better than the electronic circuits that we have available right now." Robert Hicken, a spintronics researcher at the University of Exeter, called the work "an important step in the development of spintronics technology". "This tells us that one can now begin to look at room temperature, silicon-based electronic devices; the exact design of such a device we don't know yet, but this was a prerequisite for doing it." What remains unclear, Professor Hicken told BBC News, is whether spintronics can overcome the problem of heating that conventional electronics faces as individual devices become ever more tiny.